Very Limited Edition! Only 108 Commemorative Coin Bats will be made available! There is perhaps no better way to celebrate a World Series Championship after a historic 108 year wait than with a Banner Raising and Ring Ceremony in front of your home fans. To honor this special event we are pleased to present this very limited edition Louisville Slugger bat. 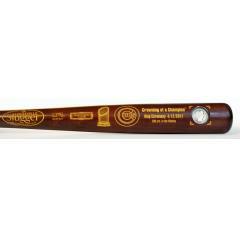 The authentic "Crowning of a Champion" Commemorative Coin Bat is a full-size Hornsby style bat beautifully engraved with the date of Cubs' Ring Ceremony and the caption, "108 yrs. in the Making." Each bat features a beautiful 1908 Barber half-dollar affixed in the barrel - the significance of which is the year in which the Cubs last won a World Series before 2016. It is the perfect addition to any Cubs fan's championship season memorabilia collection. Order yours today before they are gone. Due to the limited nature of this offer we must charge your credit card for the full price to ensure we reserve a bat for you. We will confirm your order by email. This bat is not game used. Please allow 4 to 6 weeks for delivery. Cubs "Crowning of a Champion" Commemorative Coin Bat $249.95 Sold Out!